Lea and Jim (team members) and Raquel and Wendy (Locals from Guatemala) comprised the very dynamic and hard working dental team. 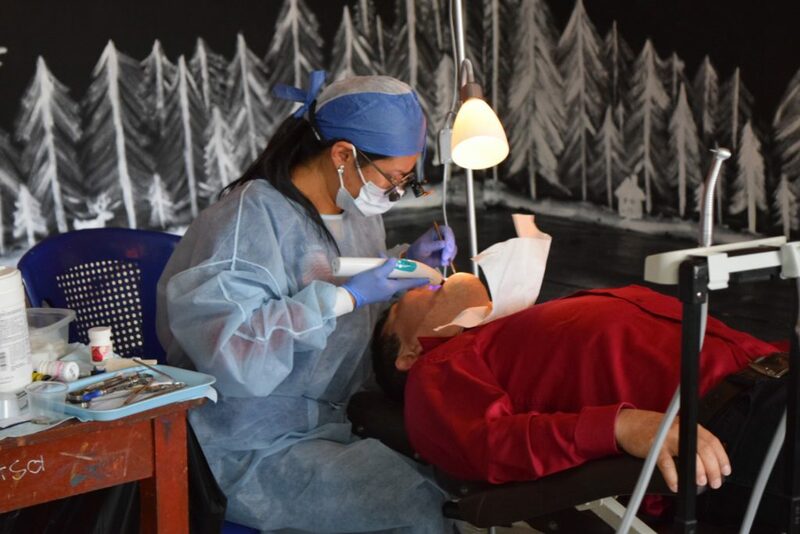 Jim was the set up man, while Lea assisted Raquel and Wendy, the dentists who serve with AVI, but live in Guatemala. Their friend and fellow dental student, Neddy, also joined the team for two days. In just three and a half days the team completed 243 fillings, and 176 extractions. The operation of the dental clinic was seamless. Even the younger children who were frightened to come, were calmed by Wendy and Raquel’s sweet, reassuring nature. We are so blessed to be able to provide this very needed service to children and adults who otherwise do no have access. I had no idea what to expect when signing up for this mission trip. I was looking for a mission experience to go on with my daughter who is a civil engineer student. I wanted to volunteer for a medical/child base mission and my daughter wanted to volunteer with environment issues. Agua Viva was the perfect match for us. My daughter worked on the instillation of a water system and I was assisting 2 fabulous Guatemalan dentist. My background is in the medical field and so cleaning, disinfecting, and setting up sterile fields was not foreign to me, but learning and helping with dental work was awesome. We saw about 90 children and staff from the orphanage and put in long hours. Knowing that we help these people who otherwise would not have this care is enlightening. The staff at the orphanage and my mission team actually showed my what working for the Lord means. I LOVED my experience, I love the children and staff at the orphanage, I love my mission team, and I am thankful that God gave me the opportunity to serve and learn. It is amazing to me that when you go to help others in need that you yourself are the one who come back with more than you give.